I’m looking for a lamb lovey my son lost a couple of years ago. He still misses her terribly. I’ve torn the house apart and am afraid that she never made it in our move. I believe she’s made by Playskool – has since been determined that it is an Evenflo lovie. I purchased her in 1999. 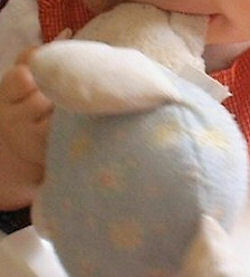 She’s about 8 or so inches long, floppy, with a light blue body (with tiny flowers), and white hands and feet. Her face was embroidered and her body contained a rattle. She was under stuffed. Her body was a sort of terry cloth material. If I could find the official name, I could do a more thorough search, so if anyone recognizes the name on the tush please let me know. My kids used to have one of these. I'm pretty sure it was made by evenflo. You're awesome! Thanks for giving me the name brand! I'm going to keep searching! ebay #300501711658 looks to be a set of three lamb elephant and doll. Let us know if you are still searching or have found it.